The average modern car has many energy efficient devices. From trip computers showing fuel consumption and engine management systems that help the vehicle to operate efficiently, through to stop-start technology and maybe even a battery in an electric or hybrid vehicle – they are all in-built to improve energy usage. But what energy efficiency technology exists in the home? Possibly solar panels, maybe a smart thermostat, but little else. Why are our homes falling behind our cars and how can we change this? To begin we need to acknowledge that the home can benefit from a combination of traditional and modern ways to deliver power. 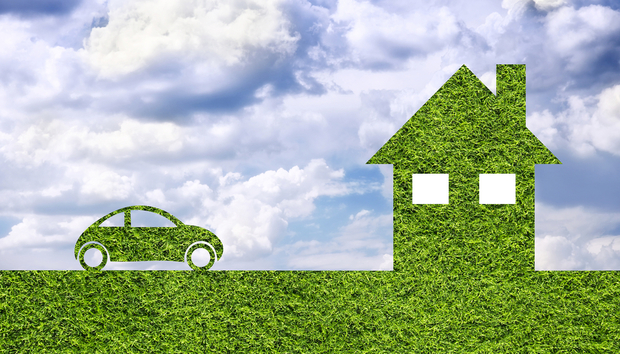 Just as a hybrid car improves fuel consumption but also delivers a great driving experience, so the ‘Hybrid Home’ could do the same – improve energy consumption and deliver a better living experience. At the heart of a Hybrid Home is a battery, charged using off-peak electricity and used to power the home during peak periods. Because off-peak electricity is around half the cost of peak, this could reduce average annual electricity bills by around 32%. If solar panels are already fitted, they can also be used to charge the battery pushing savings up further, possibly by as much as 72%. In the Hybrid Home an integrated Energy Management System will interact with the weather forecast to determine how much electricity will be generated and therefore how much battery charging is needed using off-peak electricity. The result – no waste. Other smart technology can be added – heat storage systems and smart thermostats, for example - and when smart meters are introduced, dynamic time-of-use tariffs could add more to the savings. Even better, the householder does not have to change their energy usage habits. Installing batteries into the fabric of an existing house can be costly and disruptive because they are large and weighty and require heavy-duty wiring. But in new-builds, or during refurbishment, these problems disappear. Many new homes are dependent on electricity rather than gas, and are usually enhanced by high performing insulation which means that heat requirement is reduced. On the one hand the homeowner saves on gas usage, but additional electricity demand is inevitable, which makes the use of an energy efficient home battery all the more apposite. If consumers are to embrace the Hybrid Home, they need to clearly understand the simplicity of the concept, the green and financial benefits and ease of use. Most of the technologies needed for a Hybrid Home are already available: solar panels, batteries, smart thermostats, smart meters, smart appliances. They are not yet integrated, but the Hybrid Home will do that, amalgamating the data produced and feeding this into the Central Management System to optimise energy efficiency. Most fundamental to its success however, is the interface. We have much to thank Apple for in helping to make tech less scary, and the digital screen of an in-home display or an energy app on a tablet or smartphone allows householders to visualise and interact with the energy they are using. This level of engagement puts them in control, confident about the energy they are consuming. It’s no coincidence that the key selling point behind the UK government’s smart metering advertising campaign is that this technology will bring an end to estimated energy bills [YouTube video] and the resultant ‘bill shock’ at the end of the quarter. There are good reasons, of course, why energy efficiency in cars has moved so far ahead of homes. Cars have a relatively short lifecycle, they are built as a complete unit by one manufacturer and we don’t refurbish them, we simply buy a new one. New technology therefore can be easily introduced and integrated. Homes have a much longer lifecycle. But if we want the advantages of the Hybrid Home and recognise the benefits of broader smart technology, we can start now in new home builds. We can build a market and this will help to bring costs down. There is no reason why the Hybrid Home should not be standard within twenty years, and there are overwhelming environmental and economic reasons why it should be.